Home » Blog » Scholarship Winner: Passionate About Supporting Young Mothers! Scholarship Winner: Passionate About Supporting Young Mothers! Meet Joei – A wonderful mom of two that is committed to supporting young mothers through their parenting journeys. I’ve always known I wanted to be a mom – but I never knew just how much I would love pregnancy and birth! I used to be someone who feared pain, would cry at the tiniest paper cut, but after my natural births I felt so empowered, like I could survive anything – it’s an experience I knew I wanted to help other moms achieve. It’s the build up – the weeks of testing, trying to spot that little pink line, the fear and joy of the following months as you watch your body expand to accommodate this amazing little being, and of course, the main event. That part is what really inspires me. There were moments in each of my labours that I looked up at my own mother, who’d done this three times herself, and felt connected to her, to my baby, to every woman and every mother that had ever or would ever go through this process that is so perfectly orchestrated. There is a beauty to the exact way things need to develop, the hormones that need to be triggered, the way Mom and Baby communicate in a thousand little ways for everything to go just right. The build up and then that moment, my favourite sight by far, is not the baby itself – though that is always beautiful and memorizing in it’s own right – but the mother’s face when her baby is finally out. Next time you watch a birth video, watch the mother’s face – it’s pure power, pure relief, pure Adrenalin, pure exhaustion, and pure love all at once. THAT is the reason I want to be a doula. 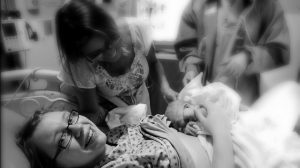 did in that moment – I want to give that to other moms. As a stay at home mom of my two wonderful children, I had a dream but I didn’t know when we could afford or how I would be able to achieve that dream. I entered the Bebo Mia Scholarship application because the course had everything I knew I needed to be successful doing what I loved, so I put my all into my submission but had no real hopes of winning. When I saw my name it was a literal dream come true, and it felt a lot like confirmation that I was on the right track with where my life was meant to go – supporting all moms, in all situations, from all walks of life and all birthing choices feel the way I felt with each of my births. Supported. Empowered. Respected. Loved. Fierce. Thank you for making that dream a reality, Bebo Mia, I’m so excited to begin my journey!